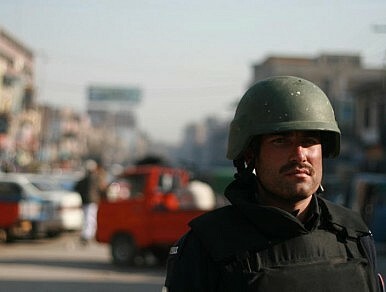 Peshawar is a hotspot for suicide and IED attacks. Mustafa Qadri travels with the city’s bomb squad to find out how local police are coping. In almost any other city in the world, last year would have sounded like a nightmare—25 bombings, including one at a marketplace in April that claimed more than two dozen lives. But this is Peshawar in Pakistan, and 2010 was a good year compared with 2009, when the city was hit by 154 incidents involving suicide bombers or improvised explosive devices (IEDs). Al-Qaeda and aligned Taliban militants in the tribal areas bordering Afghanistan claim to have an arsenal of thousands of young men and boys trained to undertake these deadly attacks. So it’s no great surprise that of all of Pakistan’s cities, this frontier capital has often suffered most. This suffering is typically most intense around ‘Ashura,’ the tenth day of the month of Muharram in the Islamic calendar, which marks the anniversary of the murder of Husayn ibn Ali, the grandson of Prophet Muhammad. It’s around this day that the vehemently anti-Shia Pakistan Taliban has often chosen to strike the minority Shia community over the past few decades. So it seemed as good a time as any to embed with Peshawar’s police bomb squad and see up close how this largely unsung group of law enforcers operates. The lead up to Ashura is one of the most dangerous periods for the Shia community as it mourns Imam Husayn’s death in large, passionate, public gatherings that are always a magnet for bombings. Complicating matters for police, this Ashura—held on and around December 16—Peshawar’s Shia community decided to hold several high-profile processions in a brave if risky display of their determination not to be intimidated by extremists. It isn’t long after I join the squad of ordinary constables and elite commando police that they are called out to respond to an incident. An IED on the outskirts of Peshawar has reportedly ripped through a school bus. Remarkably, none of the children on board are killed or even badly injured (although a young worker caught in the blast radius is badly wounded and dies soon after). TV camera crews are quick on the scene, as are a plethora of police officials and the bomb squad I’m travelling with. The mother of one of the children, who has rushed to the scene, is mobbed by cameramen. In a kind of blind fury she lashes out at the cameras filming her grief. Behind her is the large and unmistakable impact crater left by the explosion—a visible marker of this latest in a long line of deadly attacks on the city. The blood-smeared door of an adjacent mud brick house offers a troubling reminder of the blood that was spilled today. Yet despite the disturbing nature of the image, the response of both the police and the gathered crowds suggest the scene isn’t an unfamiliar one. The city’s police chief and provincial home secretary are also quickly on the scene to respond to questions from journalists. Afghanistan-Pakistan Border: Back to Politics as Usual? The risks of conflict and collapse post-2014 are significant, but disaster is not inevitable.